Q. What is the eligibility criteria to buy products on No cost EMIs with Bajaj Finserv (BFL) EMI finance? A. To avail EMI finance through Bajaj Finserv you should be an existing Bajaj Finserv EMI card holder. A. You can buy more than 5 crore products available on Amazon using Bajaj Finserv. Gold and jewellery is not covered under this. Q.How can I avail EMI finance through Bajaj Finserv? A. Just go through the normal purchase shopping process. On the payment page, please select your saved Bajaj Finserv Ltd. Card or enter your EMI card number and check whether the transaction is eligible for EMI or not. If yes, please select the desired tenure and proceed. Click on the button to generate an OTP and enter the OTP received on your registered mobile number & click on submit. You shall get an approval, and your products shall be shipped to you. Q. 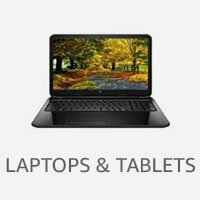 What is the minimum amount I need to shop to avail No cost EMI? A. The minimum amount that you need to shop to avail Bajaj Finserv No cost EMI is Rs. 4,500. You can either purchase any product greater than Rs. 4,500 or shop for multiple products for a min value of Rs. 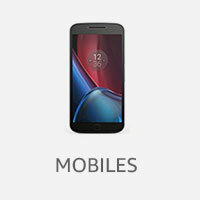 4,500 to avail No cost EMI. 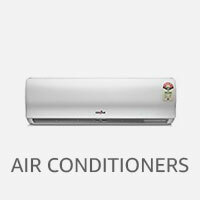 All products selected must be applicable for Bajaj Finserv No cost EMI to avail this offer. Q. Where can I check my eligibility for Bajaj Finserv EMI card? Q. 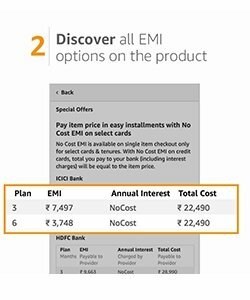 Do I need to pay anything additional to avail EMI finance through Bajaj Finserv? A. No, there are no additional charges that need to be paid. Q. What documents will I have to submit on approval of the loan? A. There are no documents that need to be submitted. Once your finance is approved, the product would be dispatched by Amazon. Q. Can my application get rejected? What do I do in that case? A. Approval/rejection of financing is solely at discretion of Bajaj Finance Limited. In the event that your loan application is not accepted, you would need to place a fresh order with a different payment type – COD or Prepaid. Q. Where would I get to know the reason for my loan getting rejected? Q. Where would I get to know the Reason for my card getting blocked? Q. Would I have to make any down payment? A. No, you do not have to make any down payment and the entire amount is converted to EMI provided all the products are applicable for Bajaj FInserv no cost EMI. The schemes are being reviewed on a regular basis and may/are subject to change without any prior notice. Q. When do I pay my EMI? How would I get to know about the same? What will be my EMI? A. Your loan gets booked in 1-2 days from the day the order is placed. Post your complete order is delivered, your loan would be booked by Bajaj Finserv. Once your loan is booked, you could view the details of your loan, such as tenure, loan amount, due date, etc. 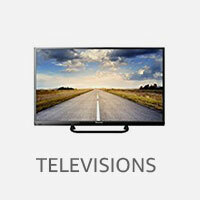 by logging in to Experia with your login credentials. You could also call us on 020-39575152 ( call charges applicable) or write to Bajaj finserv on wecare@bajajfinserv.in incase of any discrepancy. 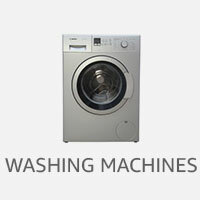 call them on their customer service numbers for further details. Q. Can someone else use the EMI card on my behalf? A. For safety and security reasons, we recommend that only the card holder uses the EMI Card for making purchases. The liability of the loan taken using the EMI Card rests solely with the holder of the EMI Card. Q. Where do I enquire about my loan details or issues with the transaction? A. You can write to us at wecare@bajajfinserv.in , call us on 020 – 3957 5152 (Call charges applicable) or visit our website on www.bajajfinserv.in. Incase if there is an issue on the product, you would have to contact Amazon customer service team. Q. Where can I get my Customer Portal (Experia) username and password? Q. How do I change my mobile number, email or address given while of opting for the EMI Card? A. 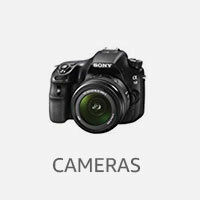 Simply log on to the Customer Portal – Experia and make necessary changes in the profile section. Alternatively you could write from our registered email id to wecare@bajajfinserv.in. For changes or you may speak to Bajaj finserv Customer Service Executive on 020 – 3957 5152 (Call charges applicable). Q. What should I do if my EMI Card gives an error? A. 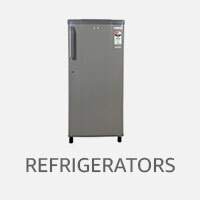 In case your problem is not resolved, please call us on 020 – 3957 5152 (Call charges applicable). Q. Can I pre-pay or foreclose my loan? A. Yes, you can foreclose your loan at any point in time post the payment of your first EMI. There are no charges to foreclose. You can foreclose your loan online by logging on to Experia (Click here) through your login credentials. Q. What is the process for cancellation of a loan or a transaction? A. Incase if you want to cancel a loan taken from our online partner, you need to cancel the order or transaction on the “My Orders” page. Post return of the product and or confirmation received from our online partner, we at BFL shall take 2 additional days for cancellation and reversal of the amount to your card. Incase if a EMI payment is been paid, the amount shall be transferred to your registered bank account in 3-4 days post successful cancellation at BFL end. Q. When will I get the refund of my EMI in case I Cancel the loan? A. Post cancellation of the loan, the amount would reflect in your registered account number in the next 2-3 working days. Q. Where can I make the payment if I have missed my payment date? A. You can make an online payment by logging in to the Bajaj Finserv website –www.bajajfinserv.in . An option is available for making payments for your EMI as well as making payment towards the overdue charges. Alternatively, you could also visit the nearest Bajaj Finserv branch for making the payment. The details of the branches near you could be discovered through the option of “Visit our branch” under the “Reach Us” section on the Bajaj Finserv website. Q. Can I make a payment in advance for my EMI? A. You can make an advance EMI payment online by logging on to our website through Experia ID and password. Alternatively, you could also visit the nearest BFL branch for making the payment. The details of the branches near you could be discovered through the option of “Locate Us” under the “Reach Us” section on the website. 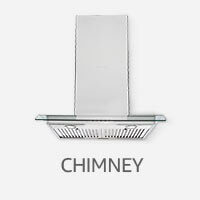 The state and city details can be entered there to get the address of your nearest branch. Any advance EMI payment needs to be made on or before 23rd of the month. Payments received post the 23rd of the month would not impact the next EMI. The next EMI would get deducted from the customer’s registered account. Q. What if I intend to cancel few items of my order and not the complete order, is that possible? A. Yes, you can cancel part of your order. You just need to visit your “My Orders” page and cancel the items which you want to return or cancel. Post details received from the partner for cancellation, we shall take 2 additional days to get back to you with your new tenure details for the loan. Q. I want to change my repayment mode (banking details)? A. Yes, you can cancel part of your order. You just need to visit your “My Orders” page and cancel the items which you want to return or cancel. Post details received from Amazon for cancellation, Bajaj Finserv shall take 2 additional days to get back to you with your new tenure details for the loan. • The Bajaj Finance No Cost EMI facility is being offered by Bajaj Finance Limited ("BFL") to the customers having a Bajaj Finance No Cost EMI card ("Card"). 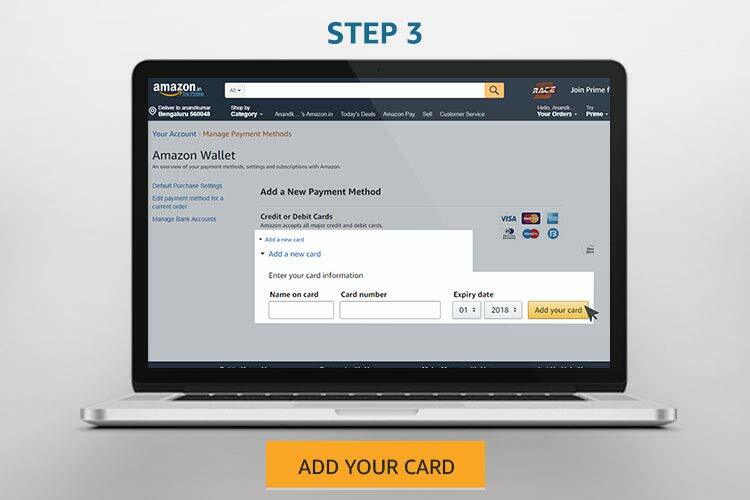 • No Cost EMI (using the Card) as a payment method is available on select products sold by participating sellers on https://www.amazon.in/ ("Website"). • The Bajaj Finance No Cost EMI facility can only be availed using the Card and is not available on purchases made using debit or credit cards issued by other banks, net banking or cash on delivery payment methods. • To make payment using the No Cost EMI payment option, customers must place an order with only one eligible item added to the cart. 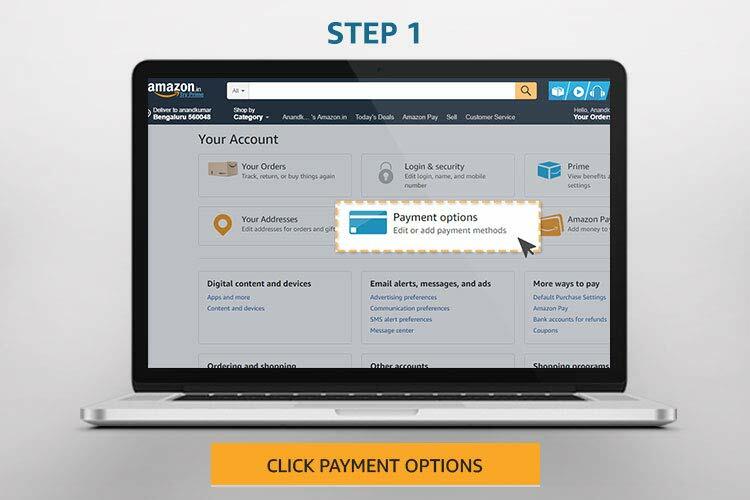 This payment option cannot be used with multiple items (including multiple eligible items) in the cart. • As long as all items in the cart are eligible for No cost EMI on BFL, you can avail the No Cost EMI with BFL option during checkout. • Amazon has no role to play pertaining to the Card including but not limited to its issuance, approval, any extension, pre-closure, or closure of any facility using the Card and such matters are solely determined by BFL. • The customer's use of the Card is also governed by the terms and conditions of the agreement between the customers and BFL. 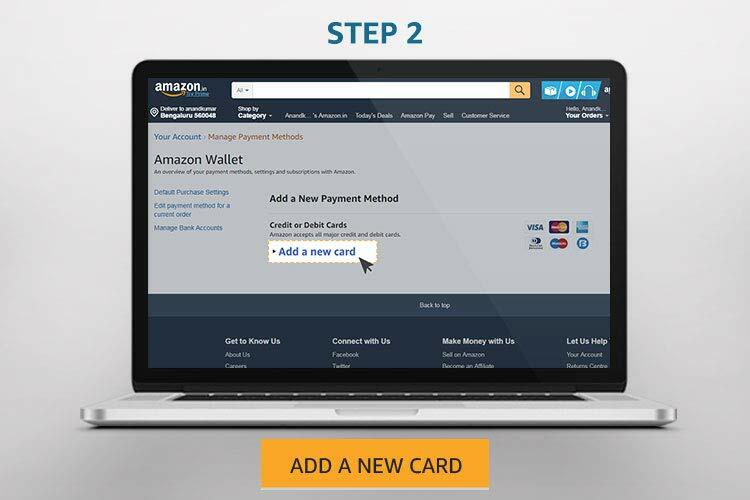 • By using the Bajaj Finance No Cost EMI facility, the customers hereby release and agree not to bring any claims against Amazon in respect of use of the Card or the No Cost EMI facility, and all such claims (if any) will lie only against BFL. 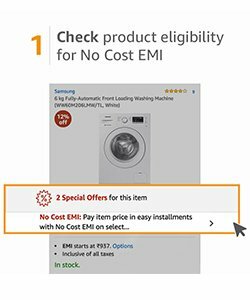 The customers also agree not to bring any claims against Amazon on account of availability or non-availability of No Cost EMI facility on the Website. • Amazon reserves the right to stop No Cost EMI facility at any time without prior notice and without any liability. 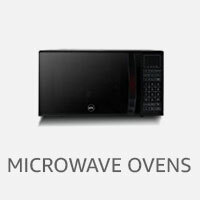 • Amazon does not charge the customer any processing or convenience fee in providing the Bajaj Finance No Cost EMI facility. • If an order using the No Cost EMI facility is cancelled, any refund to the customers or cancellation of loan facilities using the Card will be undertaken by BFL. The customers hereby agree that Amazon has no role in this regard and the customers will not bring any claims against Amazon for any refund of any amount paid to BFL for such order. 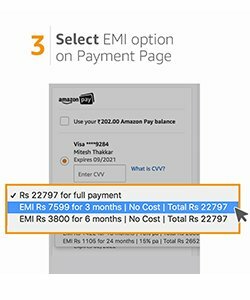 • Amazon will not be held liable for any dispute arising out of or in connection with such No Cost EMI facility or the customer's use of the Card on the Website. • Please contact BFL for any queries in relation to the Card.